On Saturday, Mar. 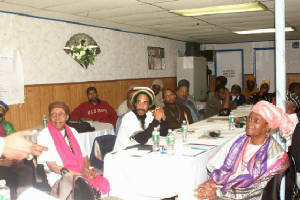 31, 2007 in Harlem, NY from 2 p.m. - 6 p.m., an Election for the African Union 6th Region Representatives took place. The African Union, whose main purpose is to establish a United States of Africa, has invited Diasporans to participate in its discussions and decision making. The invitation comes with a multi-tiered task, the first of which is to organize as a community to elect 2 Representatives and 6 Observers, state by state in the US, in Europe, Central America, Brazil and the Caribbean. All elected representatives must be in place by December 2007. This is the second and last deadline. 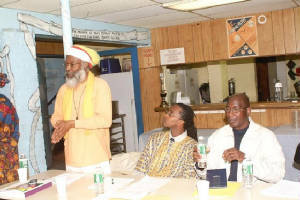 The New York community heard the call and accepted the invitation, spearheaded by Elder Adunni Tabasi of Staten Island and the Ghana Nkwanta Project under the supervision of David Horne, PAOC, (Pan African Organizing Committee) and Ras Nathaniel of WHADN (Western Hemisphere African Diaspora Network). On January 6, 2007, New York held a Town Hall meeting to put the process in motion. Part of the process called for studying the AU invitation, reviewing the definitions of the 6th Region and the Diaspora, electing a Community Council of Elders in a Town Hall forum, selecting nominees to hold the positions of Representatives and Observers for the African Union 6th Region and setting a date for the election. 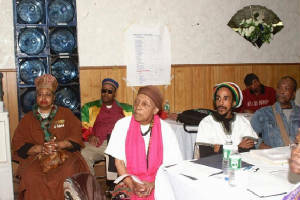 On March 31, 2007, The Community Council of Elders/New York gathered the community in Harlem at White Rock Baptist Church to have an election for Representatives and Observers. Almost 100 people from every segment of the population came including community activists, church goers, Muslims, Rastafarians, labor unionists, pacifists, nationalists, entrepreneurs, college students, mothers, fathers and everyday grassroots folks, who are the backbone of our community. The event started with presentations from the Education Campaign Director, Ras Nathaniel Blake of WHADN and Elder Adunni Tabasi regarding the Nkwanta Project which is a Ghanaian Land Grant to Diasporans. Candidates for Representative were Elder Lumumba Grant (Harlem) long time community activist, RAS E.S.P McPherson of the ENF (Ethiopian National Federation), and Nova Felder (Harlem) a community activist, scholar and educator. 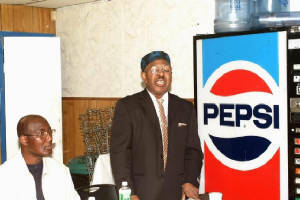 Observer Candidates were Bakary Tandia (Mauritania) and Nova Felder. It must be stated that Nova Felder is a young man and the son of veteran community activist and scientist, Dr. Jack Felder. It became crystal clear as to why this young man received nominations for both positions when he took his seat and held his own at the Nominees table. parts of the official African Union mandates and the invitation to the Diaspora and Election guidelines were read to the audience. Also, a list of the 25 people who had been nominated was passed around. Bro. Ras Nathaniel and Sis. Collymore answered all questions patiently and deftly. 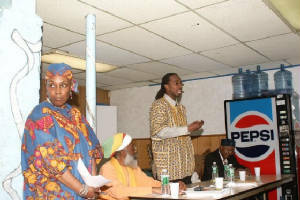 Observers - Nova Felder (Harlem Youth Activist and Educator, and Bakary Tandia Activist from Mauritania.